This pdf clocks in at 4 pages, 1 page front cover, 1 page editorial, 1 page SRD, leaving us with 1 page of content, so let’s take a look! Chilling Blast and Poisoning Blast require chill touch and poison spray as well as eldritch blast, and allow you to change the damage of the blast to cold or poison damage, respectively. Eternal laughter lets you cast hideous laughter once per long rest interval via a warlock spell slot. Devil’s Darkness requires the devil’s sight eldritch invocation and lets you cast darkness without using a warlock spell slot, with a unique recharge mechanic: When centering the spell on yourself, you can regain it on a short rest as well; otherwise, it requires a long rest to use it again. I like this. The 7th level invocation Undersea Horror nets you swim speed and proficiency in Strength (Athletics) checks made to swim. If you’re already proficient in Athletics, does that stack? I assume no. You can also breathe underater and cast water breathing once per long rest interval as a warlock spell. 9th level unlocks the option to use teleportation circle via a warlock spell slot, and adds teleport to the spell list, allowing you to take it at 13th level as Mystic Arcanum. Fiendish accuracy lets you, once per short rest interval, cast true strike sans using a warlock spell slot as a bonus action, applying its effects this turn. There is one invocation that requires 11th level to take, as well as dispel magic: Arcane nullification makes the spell treated as though it were cast with a spell slot equal to half your level, rounded down. This one should specify the cap at 9th level, obvious though that may seem. Editing and formatting are very good on a formal level, with hyperlinks added where applicable. On a rules-language level, there are very minor nitpicks here. Layout adheres to a two-column full-color standard. The pdf has a bookmark for credits and content, in spite of its brevity. 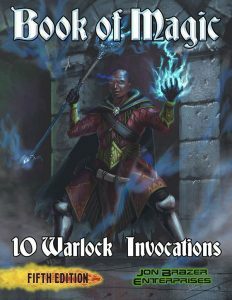 As a whole, I like Dale McCoy Jr.’s warlock invocations. The class feature isn’t exactly the most exciting thing about the class, but what we get here, is, as a whole, interesting. Now, you probably won’t be blown away by this one, but if you’re looking for an inexpensive way to diversify warlock options, this may be worth checking out. My final verdict will clock in at 3.5 stars, rounded up due to the low price point. You can get this inexpensive file for less than a buck here on OBS!